Neil has just sent us this amazing flyer. It looks like it's going to be a fantastic day for everyone going. And London Fields are the easiest to get to. If you're walking or cycling - simply follow the canal northwards until you get to the Broadway Market sign - it's at the top end of the market. If you're going by bus - hop on the number 30 & get off at Hackney Town Hall & follow the signs to London Fields.
" It's the 'Berecreative' day out organised by the Council's Green Champions, so the theme is around environmental awareness and recycling. The focus is "A Fun Family Day Out" on Saturday 7th June at London Fields, E8 from 12pm - 6pm. There are various activities, including free face painting and a bouncy castle - though you might be a bit too big for that! I mention these as they don't appear on the scan of the poster (I had to crop it for size) attached." Please see if you can make it & take something from your home to swap with someone else - take a pair of shoes & get an aquarium!! Thanks Neil - and look out for some more exciting recycling news very soon!! Today was Leabank Square's biggest project to date!!! We completely cleaned up the Lea Bank!! After years of neglect by our so called management company - a whole bunch of Leabankers got together today and scraped moss, swept olympic sand, pruned budlea, weeded cracks, washed benches and had great fun!! We started at 8.00am and finished at 8.00pm - a whole 12 hours of very hard graft - but I am sure you all agree that it is WELL WORTH IT!! 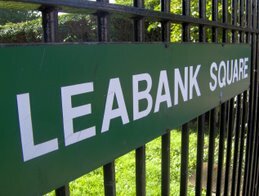 Thanks to all who helped out - together we are all turning Leabank Square into the most desirable place to live in - in the world!! I have just returned from the Olympic Meeting introducing Hackney Wick to what is going to be built directly opposite the canal from us. Leabank Square - we had all better be prepared to live a completely different life after the Olympics!!! Our legacy from the Olympics is a very built-up crowded future. There is going to be another town centre straight opposite Leabank Square. Remember all those very quiet dreamy sunny afternoons having barbies on the Lea Bank? Well - those days are over. Not only have we got all the noise & dust for the next 4 years leading up to the actual Olympics. But afterwards - as OUR part of the legacy - we will have a high street opposite the Lea Bank. A completely new picture from now on. The question is - is this a good or a bad thing? Well - the smug architect giving the presentation seemed to think that it was a great thing. His vision for the area we all once walked our dogs on, played footie on, went on nature trails on, etc - is one of a fully functioning town centre. So I suppose it will be a good thing for the employment prospects of many residents. Then most the SMALL handful of Leabank Square residents there thought it was an absolute disaster of a plan. We remember being promised our green fields back after the Olympics as OUR part of the legacy. Of course we were all very naive to believe the suits. But then when they say it to your face with a smile - it's very difficult not to believe them. Thanks to Newham Council - you can now see exactly what is going on across the canal in the Olympic Park. They have installed a webcam near the Stratford shopping centre which swings around to all the corners of the building site. If you look really carefully - you can see Leabank Square. How does everyone else feel about having macdonalds & coca cola adverts all along the Lea Bank for 4 years?!? Hackney Borough has one of the highest rates of childhood obesity - and lowest rates of child sports activity. So having 4 years of brainwashing for our kids to make the brilliant link of being an olympic sports star - by eating disgusting tasting burgers & drinking sugar - is absolute genius!!! The drawings on the posters are absolutely lovely. They have been done by some of our kids in the local schools - but to then re-inforce the link to junk food - is a very disturbing commercial ploy by the International Olympic Authority. Is there not a white paper going through parliament banning the advertising of junk food outside schools? These posters are directly opposite our neighbour - Gainsborough School - where many of our children go to. But - more importantly - these adverts are directly opposite Leabank Square - where we all relax & play. Do we really have to have very dubious advertising staring us in the face for the next 4 years? This is a great new way for us to have better discussions about anything in Leabank Square. We have started a forum group just for us here in Leabank Square. 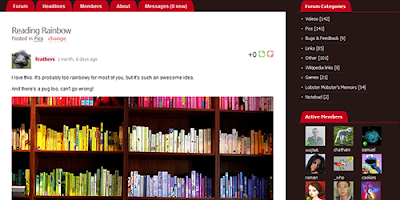 I know we have this blogsite & many are happy to simply add comments to any blogs. And some are still happy to send their comments, pics, recipes, etc to the email: leabanksquare@london.com. But this forum site is brilliant if there is a subject we all want to discuss in a bit more depth!! Pick a category - either start a new subject - or join an existing subject & contribute your thoughts about it! !So let's say that you want to discuss the noise & dust coming over from the Olympic site. Pick the Olympic category - then look for either noise or dust - and start discussing your feelings. The re-cycled handbags have crept along the Lea bank all the way to the other side. We now OFFICIALLY have the most colourful river bank in the UK. And not one bit of it was made for us. All the handbags or containers were collected out of rubbish bins, skips, bought from markets & charity shops. All the flowers were grown from seeds collected from mature plants. And all the watering is directly done - straight from the River Lea alongside!! Can any other estate say that their gardens are as low-cost, environmentally friendly as ours?! Many thanks to everyone from the square - and visitors from the rest of Hackney Wick who have helped create this garden. In a few short weeks we will be the talk of the town. I've just spoken to Giorgia Sharpe over at the London 2012 Olympic site about the dust & noise coming over the Big Blue Wall. And she has made a fantastic suggestion!!! Why don't a bunch of us go for a chat in the Olympic Site with her & some environmental staff. We can also see what happens to the data that we see them collect from the noise & air pollution monitors. She can organise a mini-bus to pick us up right here in Leabank Square & drop us back here - leaving in the early evening - sometime between 6 or seven pm. This would be the ideal opportunity to get things out in the open as we begin this 4 year journey with our new neighbours. ....... then please give me a tinkle, email or drop a comment soon. The sooner I get a bunch of names - the sooner we can chat about all the things that are bugging you. One of the round planters at the front of the green was taken over by all our kids at the weekend. It was really sweet to see how they organised themselves into a super team - and planted a whole heap of poppies. So check this planter out in a few months time - it'll be bright red!! Over the weekend this bunch of green fingers planted beautiful flower seeds in the central bit of the green. I have never seen such an enthusiastic group of gardeners. First - they turfed the rock-solid earth. Second - they dug furrows. Third - they planted about 200 seeds. Fourth - they covered the seeds. Fifth - they watered the whole garden!! Thank you ALL for such an amazing afternoon. You will see just how fantastic it'll look in a few short weeks!! We all throw away heaps of rubbish each week. Imagine if that rubbish was not picked up? Leabank Square would drown in bin liners!! I speak to lots of other Hackney Wick residents from all the surrounding streets - and believe me when I say that some homes have real problems with their refuse pick-ups. Thankfully - here in Leabank Square we have an excellent crew who come every Monday morning - and clear us out of rubbish. Next time you see them - please give them a quick bit of thanks!! It's That Time of the Year Again! !